The other day, I was reading this post of Jocelyn's over at O Mighty Crisis, and uh...needless to say, I IDENTIFIED WITH THAT BLOG POST. Mightily. Because if it's not MatchboxcarsfootballshockeysticksNintendoDSs I'm tripping over, it's SHOES. They're everywhere. And I suspect they breed and multiply in the dark of the night. Kinda like fruit flies. Exhibit D: Oh look! MORE summer shoes that were NEVER EVEN WORN this season. This box was under Baby's bed. 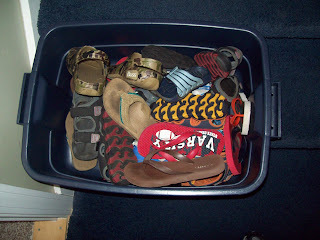 Exhibit E: Ummm...a random smattering of sneakers, cleats, workboots, dress shoes...This box was under Middle's bed. Exhibit G: My side. Not bad, right? Exhibit H: Heh. You actually thought the picture before this was all the shoes I had?! Someone please reassure me that we're not the only Trenches being overrun by a profusion of footwear! I might have you beat on the shoes issue... we are a fmaily of shoe whores, I'm afraid! We have the same issue. Which is funny, because there are only three of us in this house. But the shoes, are everywhere. I'm always tripping over them. I don't have one quarter of those shoes, we live in a warm climate, so we don't have to worry about the boot thing unless we go to the mountains or something. Holy Guacamole!! It would be 10x worse w/girls, I'm sure. I think it is a common occurence. My kids have more shoes than Carrie Bradshaw. 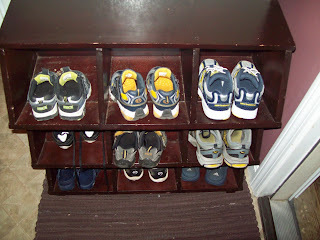 grrr - this gets me riled up - I can't stand it when everyone leaves their shoes out in my house! My hubbie is the biggest culprit! We have tons of shoes here! Actually, my daughter has most of them. I like her outfits to coordinate with her shoes. My son has about 7 pairs of shoes and I have like 3. I think they breed in those bins. oh yes we have shoes everywhere and i can not stand it. i bought a nice bench with baskets underneath and that is full and the floor has them strewn about....and hubby has so many damn pairs i hate it. hate it. It is one of the biggest problems in my house. I have a shoe problem...I am tripping over them all the time. And they are all mine. And they are pretty much all black. How many pairs of black shoes do I need??? You are far from alone! ahahahaha. I hate my kids shoes LOL. They never put them where they are suppose to be unless you count the middle of the floor the right spot. you cant see the floor of my daughters closet and I don't think the boys can even fit a match box car under the bed for all the shoes. I have a box of shoes I haven't even opened since we moved here! I am going to the circus next Weds! Will I see you there?? I'm still trying to get over the fact that all of your shoes are at least contained in one area and appear to have their mate nearby. I will literally find one of the boys' tennis shoes in the downstairs bathroom and the other one upstairs under my bed. I wish I were kidding. I completely hate shoes and can't tell you how many times we've been late somewhere because of a missing shoe. I wish we could all just go barefoot. If only it weren't for that damn "No shirt, no shoes, no service" rule. 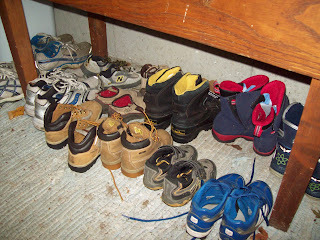 Right now most of our shoes are in huge, dangerous-when-you-open-the-door pile in our hall closet. When we moved in it was a great idea for storing them...now, not so much. I swear I spend more time looking through those shoes than I do sleeping. I feel so much better about my shoe obsession now! Phew, thanks for making my day! good grief! I can't say I can't relate though! Love shoes (and hate fruit flies)! YES! Shoes. They are everywhere. And somehow worse than the toys, because the toys are supposed to be played with so maybe that's whey they're out--signs of creativity. But the shoes? AG the SHOES! I hear ya. The number of shoes in my house is astounding. It's embarrassing! It's annoying! I'm glad I'm not the only one!